I read on here, same as everybody else, about these little wooden pens that sport a dip nib. I thought they looked interesting for sure. Dug around on the website, found the cheapest offering he had, which was $65 plus shipping, $71 total, nice and cheap for sure. Glad the cheapest pen was green. My favorite color. Got it in today and looked it over. Finish isn't fantastic, but at $71 I'm not going to complain. I'm not sure there's much else in this price range that I would like more honestly. And with a cool nib like this, probably nothing that's this much fun. It's 6" closed, and after 6.5 turns (6.5 TURNS!) the cap comes off, making it 5.5". A very nice size. The barrel and cap are just under 1/2", maybe .48" diameter. so the threads are probably around .40" diameter, and the section a couple hundredths less than that. Pretty nice size. I really like the shape of the section. All the plastic bits are delrin I think. That's what they feel like anyways. Threads are clean and smooth. But 6.5 turns to take the cap off... dang. I think I know a guy who can bore out some of those threads. 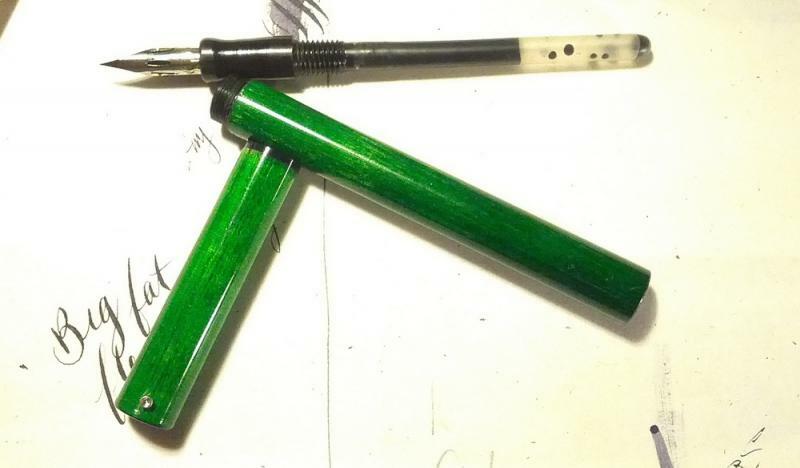 I loaded it up with Pelikan black, two quick squeezes on the sac and it was 80% full about, perfect for me. No pre wash or any of that. I'm too lazy. Writes well, too. Railroads a bit if I draw or write too fast, but with a bit of control, and slow movement, it's really cool. I've already written a note and a check with it. I'll have to sign my name differently if I use it for signatures. No quick scratch with this pen. There was a hole on the end of the barrel, I guess for the live center to fit when machining the parts. 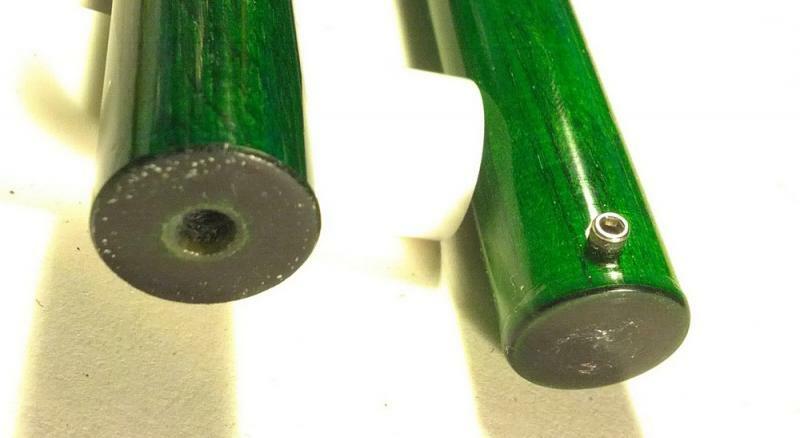 Hole doesn't go into the barrel though, so this could be used as an eyedropper if I yanked the sac, which I won't. I also REALLY like the little roll stop. A little allen head screw or bolt. Very nice touch. Overall I really like it. I can see myself playing with it until it falls apart - which hopefully it won't. If it does I'd probably pick up another. I don't like that he doesn't take paypal though - says that's something to do with squarespace. Could add the option to buy through email though - then pay with paypal. That's not a real big deal, though. Works really well with pilot b/b. What's that nib? Can you post a picture? Also, that was a clearance item. Ordinarily, cosmetic problems like those wouldn't get past my QC. Edited by PrestoTenebroso, 11 November 2014 - 15:48. It's the Nikko G nib I think. has a big G on the top of the nib. Never mind, I was unclear what you meant by b/b. You mean blue-black. I thought it was a nib. 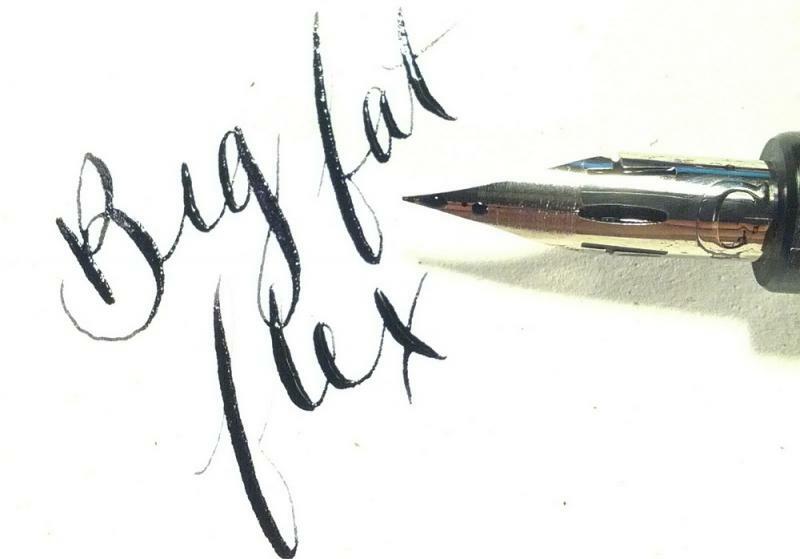 That's a pilot 78g or plumix nib, which is a stub italic that comes in a B or BB. What size nemosine do your pens fit? I am lefty and despairing at writing with my dip pen guillot 303... Do you think there's any hope if I work with a zebra g? The Nemosine F, EF, .8mm italic all fit for sure. Why do you despair with the Gillott 303? I'm a lefty side writer, so the super-pointy nib using a straight holder is catching on the paper every time I push instead of pull. I know there's a learning curve involved so I've put it aside for now until I can get a copy of Vance's Left Handed Calligraphy book. (I am obviously very green at this.) I love the line variation of a flex, but i worry my handwriting style is a contraindication to using a flex pen to prettify my script. I was planning on getting a Leonardt general purpose nib (can't remember the exact number) because it's tipped and less scratchy, but still has a little flex to it according to the description. Will that fit in your pen? The wood bodies are lovely, and at worst, I suppose I can use it as part of my daily rotation with a stub (my daily nib of choice). Does the physics of using a flex nib in a FP different from using it in a dip? 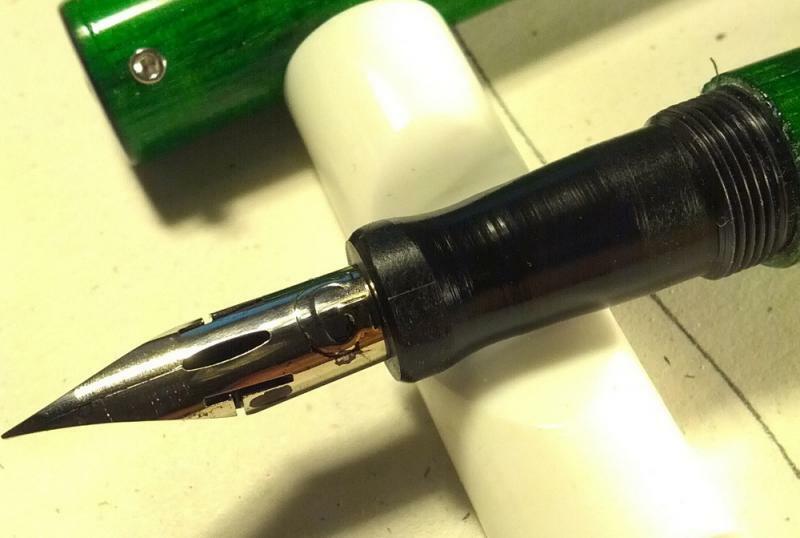 "Does the physics of using a flex nib in a FP different from using it in a dip?" I don't know about the Leonardt general purpose nib, but I know the Leonardt Principal EF won't fit. Coming soon, though. It sounds to me like you may want to get some practice of having the correct angle of nib to paper. 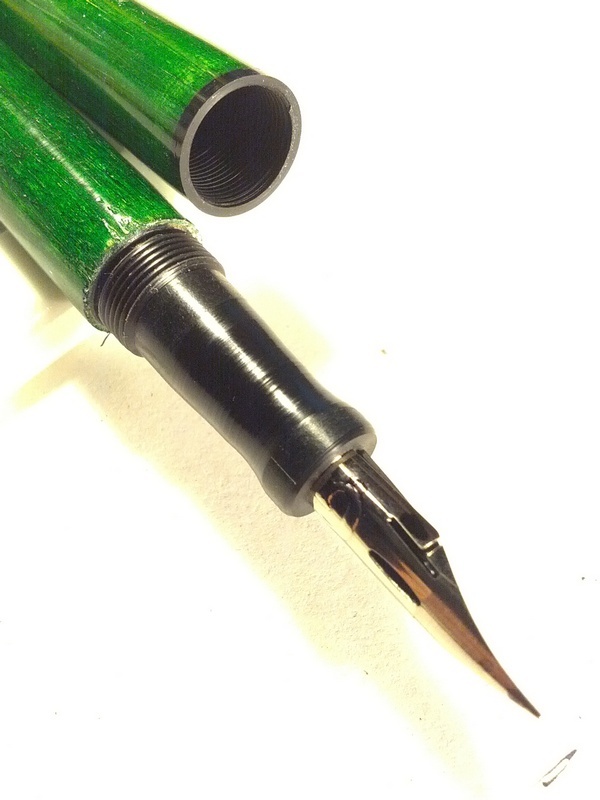 I'll say this, to get the full benefit of a flex pen, and really any pen, you may need to do some modification to the way you hold a pen, angle the paper, and form your letters. The sad truth is that leftys often develop a host of bad habits because most people don't know how to teach leftys the proper way to write; it's not just as simple as holding the pen in the other hand and doing likewise, but in reverse. It's sad, but a reality. When he signed the Affordable Health Care Act, you can see Barack Obama is a "hook writer", and he only learned that because nobody showed him the correct/best way for a lefty to learn to write. What is the correct way for a lefty to write? A guy I know used to teach calligraphy classes for lefties. He said that not only is it a matter of turning the paper, but (IIIRC) it's actually a whole different type of motion -- more like drawing the strokes on the page (of course I'm presuming he was working with dip pens, not FPs, although I don't know that for sure). Video with Platinum Carbon black. Performs better with this than any ink I've used yet.